Perforating can be a nice profit margin booster, especially on regular re-prints. Then one day your customer calls to say that they’re having problems running your perfed sheets through their gleaming, newly-installed Turbo-Kopy-Monster 7000. Or perhaps the call comes in after you deliver a job produced on your own brand new perforating equipment, an investment you hoped would deliver a better product. Or perhaps the dreaded call comes in even though nothing has changed (at least nothing obvious.) No matter what the scenario, (don't laugh...these are all true stories) the specter of a beautifully perfed and printed job coming back home to be re-worked or sorted begins to haunt you. There is however, a simple, often overlooked strategy to help you steer clear of rejected perf jobs: run a small test batch before you run the full job, especially if you’re new to perfing or it’s a job for a new customer. There are countless variables in paper, machinery and environment and all it takes is one to be out of whack to ruin the job. If you’re perf is rotary, run a small batch and then flip a handful of sheets to perf from the other side of the sheet. Send both batches to your customer for testing. There are hundreds of copiers and printers on the market and each has a different path for the sheet to travel through the machine. 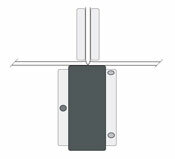 What works on one copier may fail on another and in some cases, especially with the deep perfs typical of conventional folding and scoring machine perforators, success is a matter of having the perf blade hit the sheet on the other side. Try different perf teeth configurations (teeth per inch, or tpi.) It’s dangerous to assume for instance, that when a customer tells you he’s always used a 17tpi perf, that your 17tpi will do the trick. It probably will, but if the ties (the space between the teeth) on your perf are substantially different from the customers, the strength of the perf will be affected. A perf job run on a platen die cutter could also behave differently than a perf job run on rotary equipment, even though the same perf configuration is used. Take care to keep the perf as flat as possible. Jagged, deep perforations found in perf + counter knife combinations are more liable to jam up in laser printers than a flat perf such as those produced with the perf + anvil combination (pictured on the right) technology used in our fantastic Technifold Micro Perforator. A tip for flattening out a jagged perf on your folding machine: If you’re perforating in the main parallel section, run the flat, perfed sheet through a right angle section, close all fold plates, and flatten it with pull out wheels (or use counter knives) running directly on the perf. 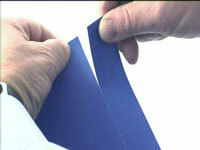 A perfed sheet that folds after perforating might need a different perf than a perfed sheet that just gets imprinted. If you’re folding in-house it will be immediately evident when a perf fails…your folder will jam. So you stop and change the perf. But if you’re applying the perf and then sending the entire job to your customer for him to fold at some point, the failure won’t happen until all the damage has been done. It’s hard to recover from this scenario. Other variables which impact performance of the perforated sheet include grain direction, humidity, coatings, ink coverage and static. Be sure to consider these factors for further testing if the basic perf test tips above don’t work. We’ve seen customers blame a “bad” perf for their problems when in fact static was the culprit. Finally, if you are wondering what to do with a rejected job, try flattening the perf before you re-work the entire job. Use your folding machine (as described above), scoring machine or even a printing press to iron out the jagged perf and then re-test in the customer’s printer. It could save you! If you want to live dangerously, go skydiving or play the lottery with your paycheck, but don’t send out that new perf job without a little advance testing. It’s a simple, common sense strategy which takes very little time for you and your customer, yet the dividends can be huge when you consider the true costs of even a single rejected job.